Mercury reaches greatest elongation east on January 14th (19 degrees @ mag. -0.7). From northern temperate and equatorial locations the closest planet to the Sun can be glimpsed low down above the southwestern horizon for about the first 3 weeks of the month, with the visibility period about a week less for those located further south. This is not a particular good elongation of Mercury; even on the day of greatest elongation it appears only 5 degrees above the horizon 45 minutes after sunset. From about January 9th to 12th, much more brilliant Venus is close by and aids in finding its more illusive neighbour. Mercury's magnitude fades from -0.8 to 0.0 between January 1st and 20th. The planet reaches perihelion on January 21st when it's located 0.308 AU (approx. 46.1 million kilometres or 28.6 million miles) from the Sun. On January 30th, Mercury passes inferior conjunction. During January, Venus becomes a brilliant evening object for observers located at northern latitudes. At the beginning of the month the planet is visible for about 45 minutes above the southwestern horizon but by months end the visibility increases noticeably with the planet setting over 2 hours after the Sun. At magnitude -3.9, Venus is unmistakable, a dazzling beacon of light that's so bright it's often reported as a hovering UFO! Venus is also visible from southern temperate latitudes this month but always appears low down above the western horizon. It sets just over 1 hour after the Sun. The phase of the planet decreases slightly from 96% to 92% as the month progresses with its apparent size increasing marginally from 10 to 11 arc seconds. On January 22nd, the thin waxing crescent Moon passes 6 degrees north of Venus. Earth reaches perihelion on January 4th at a distance of 0.98333 AU (approx. 147.096 million kilometres or 91.402 million miles) from the Sun (6:36 UT). Mars remains an early evening object located towards the western / southwestern horizon. At the beginning of January, the planet sets about 3.5 hours after the Sun from northern locations and about an hour or so less for those located further south. The "Red planet" is moving direct and continues its rapid motion against the fixed background stars, spending the first part of the month in Capricornus before crossing the border into Aquarius on January 9th. It then remains here for the rest of the month. Mars is continuing to distance itself from the Earth and it exceeds 2 A.U. (299.2 million kilometers or 185.9 million miles) on January 7th. As a result, the planet shines at only magnitude +1.1 and has an apparent diameter of less than 5 arc seconds - too small for any detailed telescopic observations. On January 23rd, the waxing crescent Moon passes 6 degrees north of Mars. Jupiter is now a spectacular object moving retrograde amongst the stars of Leo and closer to the Cancer border. The planet rises a couple of hours after sunset on January 1st and by months end is practically visible all night as it closes in on a February 6th opposition date. The current northern declination of Jupiter slightly favours Northern Hemisphere observers, but even from southern latitudes where the planet appears lower down it's still unmistakable due to its brightness. During January, the apparent diameter of Jupiter increases from 43 to 45 arc seconds with the planet marginally brightening from mag -2.5 to -2.6. A pair of binoculars is all that's needed to reveal the planets disk although it's small. Also visible are Io, Europa, Ganymede and Callisto, the four large Galilean moons. 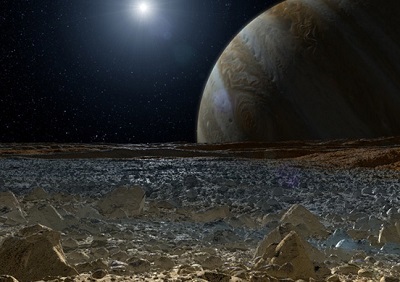 As they orbit Jupiter they are constantly changing position. Sometimes all four are visible but on other occasions some or all of the satellites will be temporarily obstructed and hidden as they pass behind or in front of Jupiter's disk. When viewed through a telescope, Jupiter is a stunning sight. Even a small 80mm (3.1 inch) scope will shows the main northern and southern equatorial cloud belts and other finer details on the planets disk. Larger telescopes reveal much more including smaller belts, ovals, festoons and of course the famous "Red Spot". 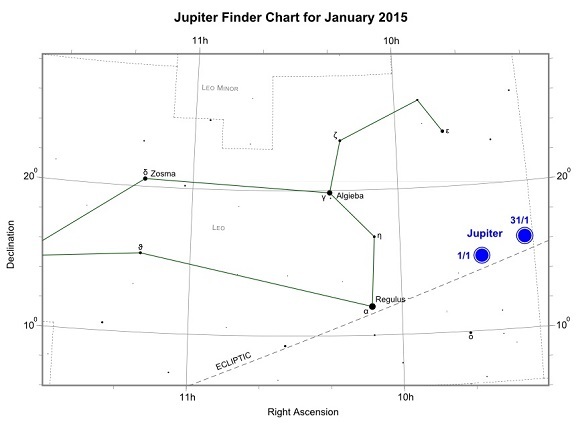 On January 8th the waning gibbous Moon passes 5 degrees south of Jupiter. Saturn (mag. +0.7) is now an early morning object. It begins January moving direct amongst the stars of Libra rising more than 3 hours from the Sun from northern temperate latitudes and only slightly less for those located further south. The visibility period of "Ringed planet" increases as the month progresses with the planet rising a few minutes earlier each subsequent morning. When viewed through a telescope Saturn is one of the outstanding objects in the night sky. Even a small refractor will show the planets rings with larger scopes displaying them in supreme glory along with subtle details on the planet's surface and many of its brighter moons also visible. 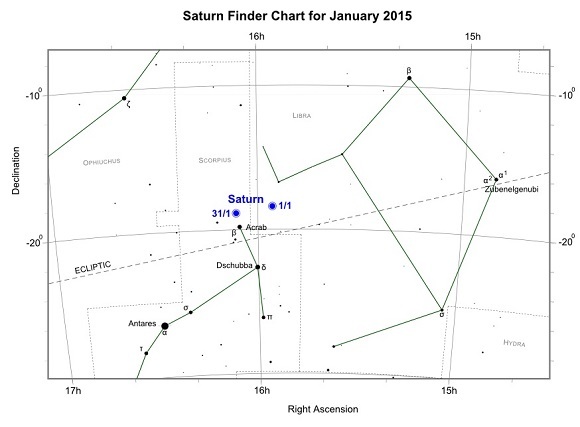 On January 16th, the waning crescent Moon passes 2 degrees north of Saturn. Uranus is an evening object moving direct amongst the stars of Pisces. During January the planet is visible as soon as it's dark enough but now sets before midnight by months end. Uranus is currently positioned about 15 degrees south and 20 degrees east of the centre of the "Great Square of Pegasus". It's bright enough to be easily spotted with binoculars or a small telescope and is also just about visible to the naked eye but this is a challenging task, requiring dark skies. The almost first quarter Moon passes 0.6 degrees north of Uranus on January 25th and an occultation is visible from Southern Europe, North Africa and Russia (11:52 UT). Neptune, mag. 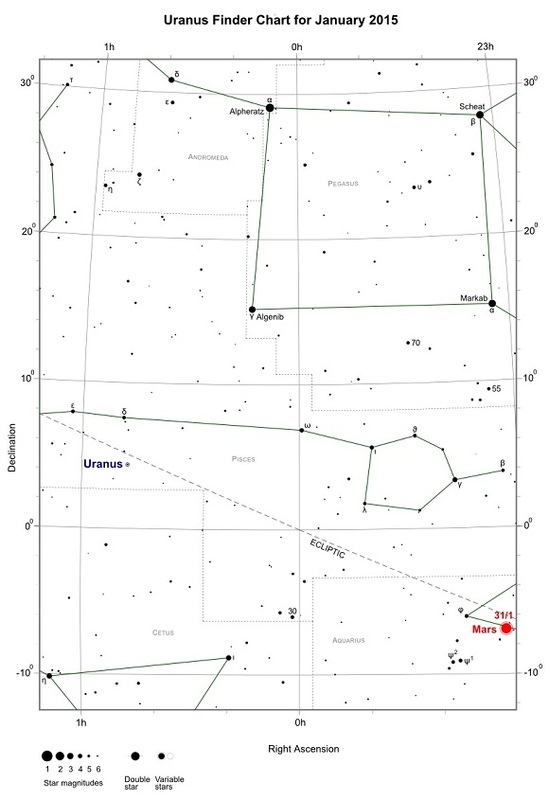 +8.0, located in Aquarius is visible for a short time after sunset during January. The planet appears low down above the western horizon. January represents the last chance to catch a glimpse of the most distant planet before it reaches solar conjunction in February. It's not visible with the naked-eye but can be seen with binoculars when the sky is dark enough. 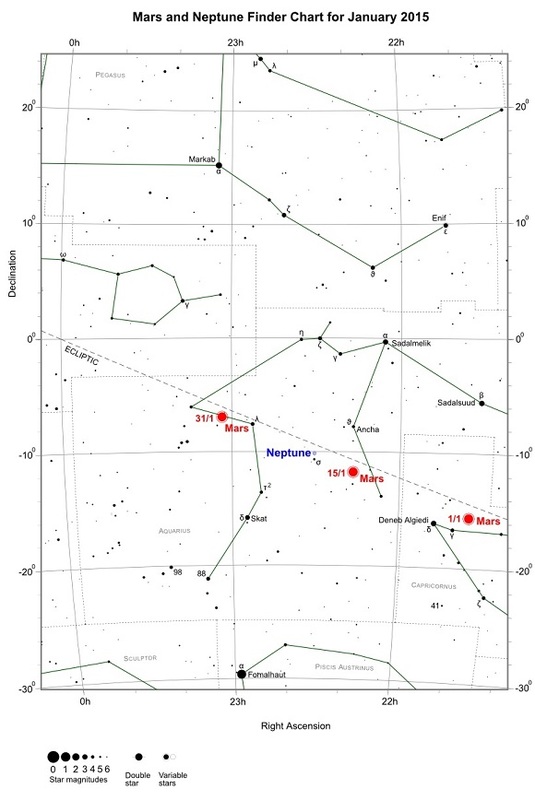 On January 19th, an interesting conjunction occurs when Mars passes just 0.2 degrees south of Neptune (mag. +8.0). The pair should be visible in the same field of view through a small telescope of the order of 100mm (4-inches) low down above the western horizon as soon as it's dark enough. The waxing crescent Moon passes 4 degrees north of Neptune on January 23rd.